and are willing to work for it! Capitol Conferencing understands how important your business communications are and we are committed to the smooth execution of your meetings. Customer support is available to you 24/7/365 at 866-766-0100. Anytime you hear a voicemail message, always leave your name and phone number where you can be reached and your account representative will return your call promptly. Co-op invoicing is the solution. It is used frequently by associations, coalitions, etc., that may be working together for like legislation, special meetings, or like causes. Contact your account representative today to request co-op invoicing for an upcoming conference call. “Free” Conference Calling internet advertising – Don’t be fooled! Don’t be fooled by internet sites that offer “free” conference calling. If you read the fine print, it notes that even though there is not a charge (invoice) for the conference call, usual long distance telephone charges apply. These usual long distance charges are "additional charges" that appear in a separate area on your phone bill from the company managing the conference call. This means that in reality, each participant on the “free” conference call may be charged a higher than normal per minute rate for long distance by the teleconferencing company. Everyday we have new customers switch to Capitol Conferencing because of charges on their phone bills for so-called “free” conference calls. If you have looked at “free” conferencing to share costs, talk to Capitol Conferencing about special Co-op invoicing – it is the perfect solution for customers that need to share the cost of a conference call between participants. See Co-op invoicing section above. 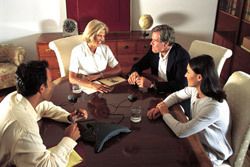 Not sure if you are getting the best service for the best price for your conferencing needs? Capitol Conferencing will be happy to provide you with an “apples to apples” analysis using one of your current invoices. The service is free of charge. We want to show you that we can provide the best service for the best price. Contact an account representative today. Capitol Conferencing rewards you or your company for referrals. Ask your account representative about your reward for referrals that become customers of Capitol Conferencing. Friendly, courteous & knowledgeable staff! This service is available for conference calls that have been recorded to CD or cassette. Ask your account representative for complete details on how this service would benefit you and your staff. Fax Receive allows large quantities of "signed" forms to be received during a short period of time, perfect service when a signature is required. Low cost long distance is available for both personal as well as business use. Our long distance service includes travel cards with no surcharges, any type of toll free (800, 888, 877) and T-1 rates.